A carbon or diamond nanothread is a tetrahedrally-bonded carbon crystalline nanomaterial (a close-packed sp3 bonded carbon structure). Its structure is similar to that of diamond. DNTs are only a few atoms across, more than 20,000 times thinner than a human hair. The nanothread also may be the first member of a new class of diamond-like nanomaterials based on a strong tetrahedral core. "Our discovery that we can use the natural alignment of the benzene molecules to guide the formation of this new diamond nanothread material is really interesting because it opens the possibility of making many other kinds of molecules based on carbon and hydrogen," Badding said. "You can attach all kinds of other atoms around a core of carbon and hydrogen. 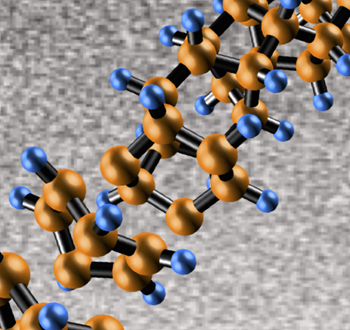 The dream is to be able to add other atoms that would be incorporated into the resulting nanothread. By pressurizing whatever liquid we design, we may be able to make an enormous number of different materials." Every type of DNT has a very high Young's modulus (stiffness). The value for the strongest type of DNT is around 900 GPa compared to steel at 200 GPa and diamond at over 1,200 GPa. If diamond nanothreads live up to their lab tests, their applications could include serving as the material to construct a space elevator. Their incredible strength and thinness could make them light enough to actually carry objects and passengers into outer space.